(Sept 1): Wall Street ended lower on Monday and wrapped up its worst month since 2012 after comments from a senior Federal Reserve official heightened fears among investors of a potential US interest hike in September. Fed Vice Chairman Stanley Fischer on Saturday said US inflation would likely rebound as pressure from the dollar fades, allowing the Fed to raise interest rates gradually. Many analysts took Fischer's comments as a sign the Fed would raise rates in September, instead of December. That shook investors who were already jumpy after weeks of turbulence caused by concerns about a stumbling Chinese economy. "What you see in the market today is caused by Fischer's comments over the weekend. If they move in September, it's going to cast a lot of doubt about where they will stop," said Stephen Massocca, chief investment officer at Wedbush Equity Management LLC in San Francisco. Fischer's remarks at the global central banking conference in Jackson Hole, Wyoming suggested the Fed does not see the recent stock market drop and concerns about China as reasons that would keep it from raising rates. A decade of near-zero interest rates has helped the US stock market stage a spectacular bull run since the financial crisis and investors are worried those gains many end once rates start to climb. The CBOE Volatility index, known as Wall Street's "fear gauge," rose about 9.14% to 28.43, above its long-term average of 20. It spiked to as high as 53.29 last week. Investors will keep a sharp eye on the Labor Department's monthly jobs report on Friday, which will be the last one before the Fed meets on Sept 16–17. "We can still expect to see some significant drops in the market until we get some direction from the Fed regarding a rate increase," said John DeClue, chief investment officer of US Bank Wealth Management. The Dow Jones industrial average lost 0.69% to end at 16,528.03 points and the S&P 500 fell 0.84% to 1,972.18. The Nasdaq Composite dropped 1.07% to 4,776.51. Nine of the 10 major S&P sectors were lower with the health index's 1.85% fall leading the decliners. The S&P energy index rose 1.05% and was on track for its best four-day gain in seven years, boosted by ConocoPhillips and Phillips 66. Crude oil prices jumped after data indicated surprise cuts to US oil production and as OPEC said it was ready to talk to other producers about the recent drop in prices. In August, the S&P lost 6.3%, the Dow fell 6.6% and the Nasdaq declined 6.9%. On Monday, Celgene fell 4.80%, weighing the most on the S&P 500. Phillips 66 rose 2.38% after Warren Buffett's Berkshire Hathaway disclosed a $4.48 billion stake in the oil refiner. Declining issues outnumbered advancers on the NYSE by 1,724 to 1,339. On the Nasdaq, 1,432 issues fell and 1,380 advanced. The S&P 500 index showed one new 52-week high and two new lows, while the Nasdaq recorded 24 new highs and 22 new lows. Volume was lighter than in recent days. 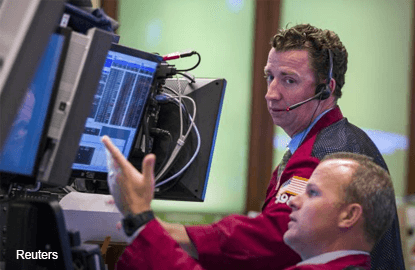 About 7.8 billion shares traded on US exchanges, compared to an average of 10.7 billion in the past five sessions, according to BATS Global Markets.